Bangalore, Karnataka, India: At ISE 2019, Crestron, a global leader in workplace technology, will debut its expanded DM Lite™ endpoint product line including the new HD-RX-510-4K-E receiver. The HD-RX-510-4K-E provides auto-switching, amplified audio outputs for speakers, and network connectivity for management and setup. Paired with an award-winning Crestron MPC3 media presentation controller, the HD-RX-510-4K-E provides a complete, low-cost, and scalable room system with intuitive control via engraveable buttons and dials that can be configured through the .AV Framework™ configuration portal. The system can be provisioned, monitored, and managed using any web browser via the award-winning Crestron XiO Cloud™ IoT-based provisioning system. Crestron will be demonstrating the entire DM Lite product line in Hall-2, Stand C20 at ISE 2019, 5 – 8 February. 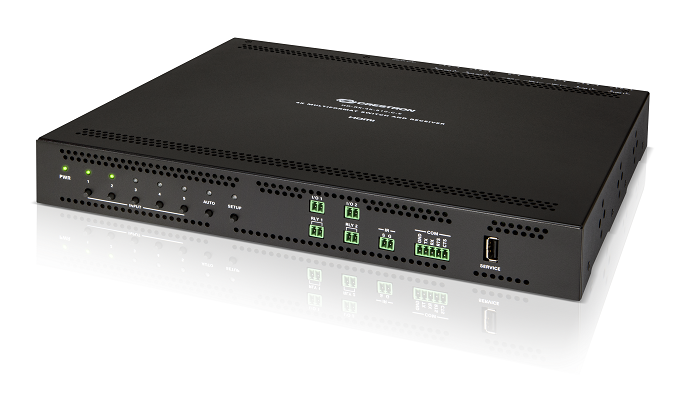 At ISE 2019, Crestron, a global leader in workplace technology, will debut its expanded DM Lite™ endpoint product line including the new HD-RX-510-4K-E receiver.